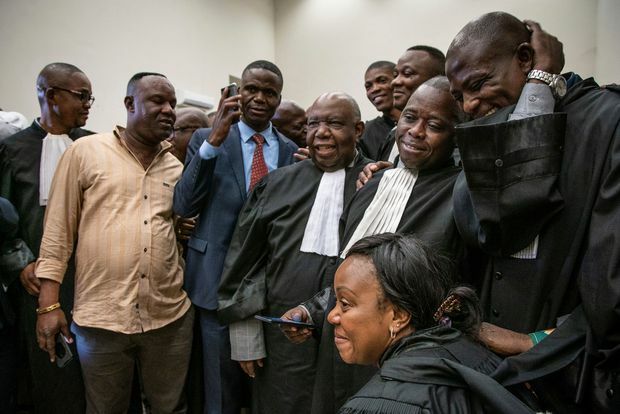 UDPS lawyers, representing Felix Tshisekedi, celebrate following the pronouncement of the judges of the Constitutional Court which invalidated Martin Fayulu's appeal and confirmed Tshisekedi's victory in the presidential election in Kinshasa on Jan. 19, 2019. Just days after expressing “serious doubts” about Congo’s election results, African leaders are now rushing to congratulate the declared winner, signalling that their new priority is the stability of one of Africa’s biggest and most war-ravaged countries. Congo’s constitutional court, considered loyal to President Joseph Kabila, announced after midnight early Sunday that the election winner was Felix Tshisekedi, despite widespread evidence that he received fewer votes than another opposition candidate, Martin Fayulu. A series of independent tallies – by media outlets, the Catholic Church and academic experts – have found overwhelming evidence of a landslide victory by Mr. Fayulu. But the election commission and constitutional court said Mr. Tshisekedi won with 39 per cent of the vote − narrowly ahead of Mr. Fayulu − and he is now expected to be sworn into office on Tuesday. Analysts predict that Mr. Kabila will retain substantial control of the new government, despite the electoral defeat of the ruling party’s candidate. His party won a parliamentary majority, according to official results, and he is likely to keep control of Congo’s security forces. The result does mark, however, a rare peaceful transfer of power in a country where most rulers have entered office after a military coup or assassination. Mr. Fayulu, a businessman whose candidacy was supported by a coalition of opposition parties, rejected the official results and complained of a secret power-sharing deal between Mr. Tshisekedi and Mr. Kabila, who has ruled the Democratic Republic of the Congo for more than 18 years. In a statement on Sunday, Mr. Fayulu said he considers himself the “sole legitimate president” of the country. He said the constitutional court was serving a “dictatorial regime” by validating false results. He urged the Congolese people and the international community to refuse to recognize the official results, and he asked his supporters to hold peaceful protests. The Congo political crisis has become a major test for African leaders, who have repeatedly supported the idea of “African solutions for African problems.” Their questioning of Congo’s election results was a rare instance of resistance to an official election outcome on the continent. But on Sunday their resistance seemed to collapse. Last week, Southern African leaders called for a recount in the election, although they later reversed their stand. Last Thursday, the African Union jumped into the fray, warning that there were “serious doubts” about the accuracy of the official results. But after the announcement early on Sunday morning, when the Kabila government ignored the AU’s doubts and went ahead with the court verdict to upheld the election results, the AU abruptly cancelled its urgent mission to Congo. And a host of African leaders swiftly issued their own statements of congratulations to Mr. Tshisekedi, making it clear that they now accept the official outcome. The presidents of South Africa, Tanzania and Kenya were among those who congratulated the official winner. “Now that the highest court in the land has ruled, all the people of Congo and all stakeholders are urged to accept the outcome,” South African President Cyril Ramaphosa said in a statement on Sunday. He urged the Congolese people to “preserve peace, stability and security of the country,” and he emphasized “the need to respect the sovereignty and territorial integrity” of Congo. There was relative calm in the streets on Sunday, but earlier unrest over the election results has killed 34 people, injured 59 and led to 241 arbitrary arrests, according to the United Nations human-rights office. Mr. Tshisekedi, 55, is the leader of the Union for Democracy and Social Progress, the oldest opposition party in the country. But he has never held a senior elected office and lacks the stature of his popular father, the party’s former leader, who died in 2017.